the sun is shining, the birds are singing, there are maybe 15 degrees outside, but my skirt is ready and i WILL go out to photograph it ! do ignore my shining white legs. 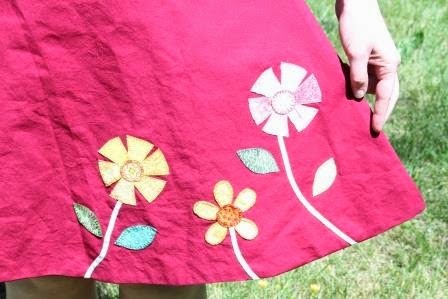 pretty embroidery hides un ugly top stitch. don't tell the sewing police. What a sweet skirt and that flower detail is so cute. I'm baring my white legs any chance I get too! !